The Slender Man (Homo gracilis) is a monster that is 8 feet tall and is more elegantly dressed than most monsters. 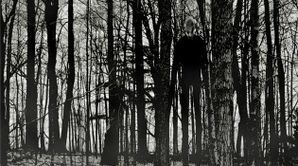 The Slender Man is known to live in deep dark forests, so it can ambush forest animals like deer, hares and the occasional bear. Unfortunate to itself, it only attracts humans. It is very aware if this and chooses to take out its rage on the heroes unlucky enough to encounter it. In terms of strength, it is somewhat frail, it's just that heroes either can't see it without fainting of fright, so they end up swinging at the air 95% of the time. The name Slender Man refers to not only its abnormal size, but the fact that it is always hungry due to the lack of animals for food. This page was last edited on 6 February 2019, at 23:50.